Twelve-year-old Kane swept the black and white squared linoleum floor. The broom swished back and forth, brushing bits of chocolate and crumbs from other dropped sweeties into a pile. Kane felt his heart swell with pride. A nodding head gave its approval. “Very well. I'll be back in a hour. Do you think you can handle it?” The boss waited for another nod and then left Kane alone. Kyle stepped up to the counter. “We heard you got a job here with auld man Rutherford and came for a sweetie.” The boy lifted the lid off and reached inside, grabbing a handful of boiled sugar drops. “You can't have them unless you pay for them. If he notices anything missing, I'll loose my job.” Kane glanced from jar to jar to make sure they weren't pinching any sweets. “He's no friend of mine,” Kyle said, walking to the door. “Nor mine.” Rory shut the door behind them. Kane stood watching them through the windows as they walked away from the shop. “I didn't. I promise. They wanted me to, but I said no,” Kane said. The next day at school his friends avoided him. Whenever he approached they ran off. Mathematics class was at the end of the day. Rory, Kirsten and Ramsay were in the class. Whenever Kane looked at them, he'd find them whispering things to the other classmates. After his boss had left, Kane went to work. He refilled the Rosebuds and Turkish Delight. He'd just screwed the lid on when the door opened. The bell tinkled as the four friends marched inside. The others nodded, arms folded across their chests. “Go ahead and do that if you want. No sweets unless you pay for them. That's the rule.” Kane spoke with firmness. “All right. If you want it that way.” Kyle turned and winked at the others. Ramsay and Rory ran behind the counter and threw Kane to the ground. They pinned him while Kyle and Kirsten filled bags up with sweets. “I think we have enough for now.” Kyle ordered them to let Kane go and the four of them rushed out the door. Kane stood, brushing the dirt off his shirt. “Don't speak. Just leave.” He pointed to the door. Kane's chin drooped on his neck. He sauntered out of the door and down the street. “What do you care? I got fired. You and Kyle and the others made me lose my job. Mr. Rutherford thinks I gave you all the sweets. Leave me alone. Go and play with your friends. I don't want to talk to you again.” Kane ran off, leaving the upset girl standing in the middle of the sidewalk. 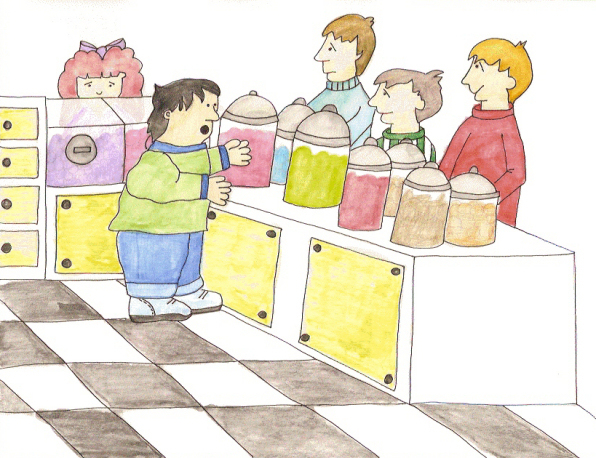 Without hesitation, Kirsten marched into the sweetie shop. She explained to Mr. Rutherford that Kyle was behind all of it and he coerced the others to do this. When she finished her story, she left. Kane gulped. “Oh.” He took the telephone from his mother's grasp. Kane, thrilled to have his job back, accepted the offer. The next day after school he went to the sweetie shop. He grabbed a broom and worked cleaning the place up. When the door opened and the bell tinkled, he looked up. Kirsten stood there. “Oh no. I thought you guys weren't allowed back in here.” Kane scowled. “It's only me. Mr. Rutherford said I could work for him, to earn the money from the sweeties I ate.” Kirsten smiled and picked up a cloth. She polished the jars until they shone. Kane and Kirsten worked at the shop for the next year and they both got raises!